Luxury Homes In Naples, FL. Beasley & Henley Interior Design, (www.BeasleyandHenley.com) is proud to have completed ‘The Viansa’, a single family home model for Lennar (www.Lennar.com) in Naples, FL. This 2,350 sqft penthouse residence presents a chic livable style for the casual yet upscale living this target market desires. The home includes a great room, island kitchen, dining room, office, three bedrooms, three full baths and one powder room, and outdoor living areas. The gorgeous home features an elegant owner’s suite with crown molding and oversized baths. The Beasley & Henley design team created an earthy coastal design featuring monochromatic, tonal color elements in the backgrounds, with unique layered colors of aqua, coral and green. The rich toned hardwood flooring in the main living areas brings a balanced elegance and warmth to the home. 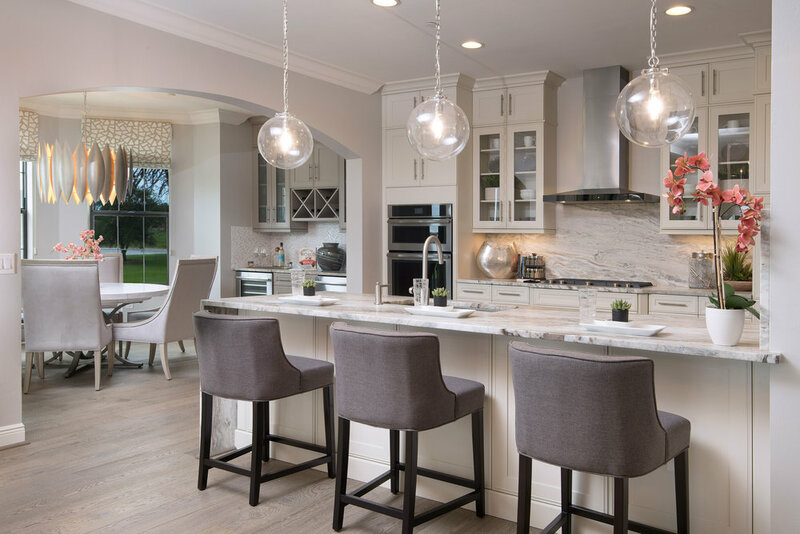 The cabinetry is shaker style throughout and the countertops are made of quartz. Beasley and Henley transformed the den into a luxurious home office. An eclectic mixture of decorative lighting compliments the rooms in the most attractive way. The overall ambiance is one of light Florida living with an air of luxury. The Viansa model is located at 16391 Viansa Way (unit 102), Naples, FL.